A great first half gets lost as this movie gets stranger and stranger, and much less grounded, in its second half. In 2014, director Alex Garland burst onto the scene with the breakthrough movie Ex Machina, a truly original and creative film. That movie was about two guys spending a weekend together in a giant home away from civilization, with a bunch of robots to experiment on and work with. It had a sort of Sleuth meets the Shining feel to it, and was both innovative and frightening. With Garland’s follow-up film, Annihilation, all that is out the window. It’s not a bad movie, but the effort to really give us something we have never seen before is no longer there. Instead of a very contained and claustrophobic movie such as Clue, The Shining, Sleuth, or Cube, Annihilation is basically a movie about exploring another planet or world. Only instead of our characters going into space, this time the strange new world has come to us. Consider it like a horror take on Stargate. That movie was about a sort of parallel dimension existing on earth at the same time as the dimension we are in. This movie is about a sort of fog that surrounds an area and that the characters go into to find answers. They call it “the shimmer.” It takes a while for us to get to that, and that’s a good thing, because the setup and character development in this movie is pretty great. Our protagonist is Lena, (Natalie Portman,) a professor of the science of cells. We meet her while she is teaching, and then leave to find her invited to a barbecue by a colleague. When she refuses in favor of staying in and repainting her bedroom, we get to hear him tell her she needs to get out and move on, past her missing and most likely dead husband. While we watch scenes like this, of Lena’s story, we also move in two other directions. There are flash forwards to show us a man (Benedict Wong, from Doctor Strange,) dressed in a hazmat suit asking Lena questions about missing people. And there are also flashbacks to show times with her husband, Kane, (Oscar Isaac, reteaming with his Ex Machina director.) What’s amazing is that none of this gets confusing. Three different timelines and we are easily able to keep track of it all. The way Garland accomplishes this is by not giving us all three back to back. Instead, the flash forwards are at the start of the film, and the flashbacks occur when we see Lena, sitting at home, thinking. We can tell that these memories are what she is thinking about. One of the flashbacks is of the day when Kane shipped out for a secret mission, and how it was actually a day earlier than they had planned. This is a problem considering that he and Lena had a whole agenda planned for what to do on their last day together. And now he’s sitting there, at the edge of the bed, telling her he has to leave. Not today, not a few hours from now, but right now. It’s a pretty lousy way for her to wake up. And now the backstory is done, so we can move forward and get into the current story. It starts with Kane returning. He just walks through the bedroom door and gets the biggest hug and embrace you can imagine. He’s back home and safe, and for the past year, Lena didn’t even think he was still alive. So it’s fair to say that while she’s thrilled to see him, she’s not exactly happy with him for leaving her thinking he was dead for the past year. And so Lena asks questions, but gets absolutely nothing back for answers. What she does get is Kane suddenly going into shock and needing some emergency medical treatment. They get in an ambulance and are headed to the hospital when suddenly the vehicle is surrounded and men with guns get out of their cars, point the weapons at them, and demand that Lena and Kane come with them. Suddenly they are taken to a secret underground facility, where a woman named Dr. Ventress (Jennifer Jason Leigh,) is standing over Lena, telling her she can’t see a lawyer. What she does have is some information about Kane, and where he’s been. Lena, being a cell scientist, wants to know as much as she can about what he’s been exposed to and what he might have. She gets a little bit of that from Ventress. Lena goes up to the roof to get some air and sees that this is where the other scientists in the building hang out. They tell Lena a little more about what’s going on, not realizing that she is Kane’s wife. They even tell her the story of what happened to Kane, (as much as they know, anyway.) And then they let her know that they are going out there too. Out of all the people who have gone out there, into the shimmer, on missions, only Kane has made it back. And he’s not exactly in great shape. So the question on the table should be “why the hell are you going out there? You do realize you’ll probably die, right?” Only that question is never asked. Lena agrees to join the group, which is composed of four women. There’s Lena, Ventress, and three other scientists, Anya, Case, and Josie. So five women in all. When asked why, the answer is simply because men have already tried and failed. I’m not buying it. Clearly the film’s featuring a team of five women and zero men is meant to get people’s attention, and it does, but there probably should have been a better explanation. Lena has joined because she wants to find answers that might help her understand what’s happening to her husband. And the women head out, into the shimmer. The rest of the movie is about the exploration of this new world. And most of it is pretty cool. There are creatures and beasts, videos that show what happened to the men who were there before them (let’s just say there were some pretty terrible things going on,) and a light house that the team is trying to reach, where apparently a meteor crashed at, leading to this whole shimmer situation. There are surprising moments when crew members turn on each other, (although the reasons why don’t exactly make sense or warrant this kind of reaction,) and some pretty horrific moments. One of the coolest creatures in the film opens his mouth to reveal the screams of people he has killed. But the movie does fall apart in its final act, and it feels like much more than just one act. The last part of this movie goes on and on. It moves slowly and is pretty dull. On top of that, it’s where the movie goes all out with weirdness to the point where we stop caring or believing. 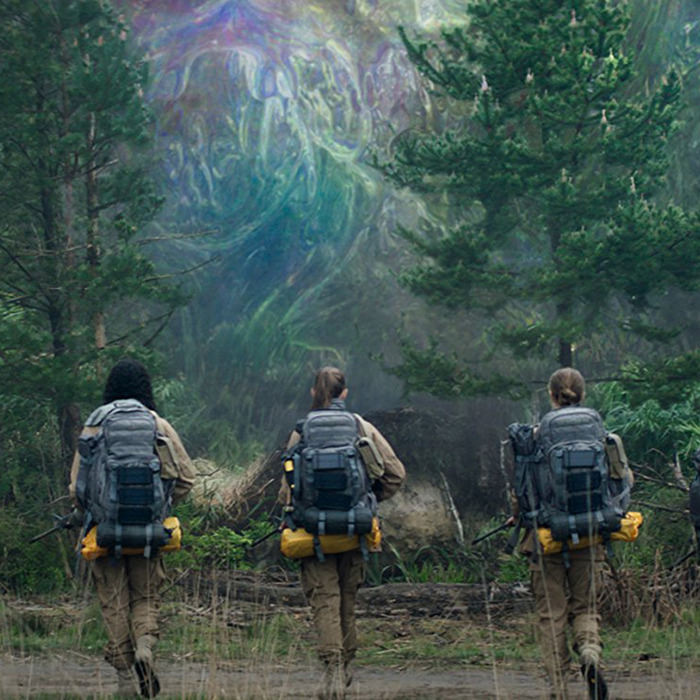 A good sci-fi movie contains the believability factor, where the audience can say, “yeah, maybe this could happen someday.” Ex Machina certainly had that. 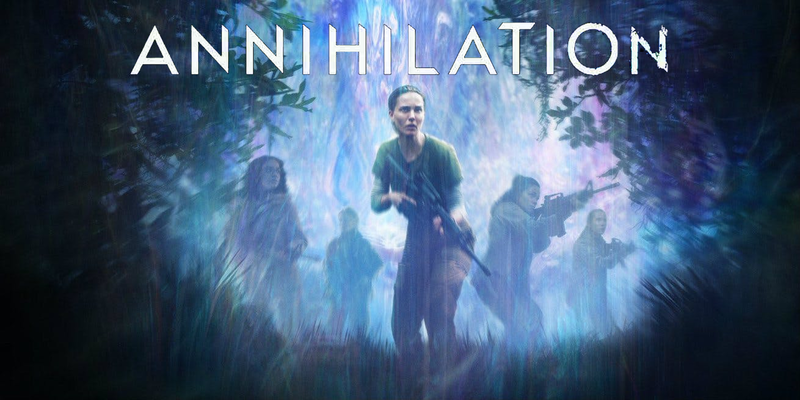 The final act of Annihilation is more like the ending of AI: Artificial Intelligence, which means it just gets stranger and stranger and more and more unbelievable until it reaches the point where the audience has checked out, and then it still keeps going. Luckily most of the movie up until this point is pretty good. It might not be half as creative as Ex Machina was, but it’s still kind of fun.